You don’t have to travel far for a destination wedding. When the couple contacted Intimate Weddings of Orlando, Victoria showed them lots of options for their intimate ceremony. Chris and Susan took a short drive from Tampa to Walt Disney World, to get married at Paddlefish at Disney Springs. High above the water, on the third floor of Paddlefish, Chris and Susan took their wedding vows, exchanged wedding rings, and were married in front of their family and friends. Rev.Glynn Ferguson of Sensational Ceremonies worked with the couple to create a one of a kind cusm ceremony that fit the two of them. With vows they chose from his ceremony planning kit, the couple made sure their ceremony reflected their love for one another. Flowers by Lesley helped create a beautiful bouquet and boutonniere for Chris and Susan. 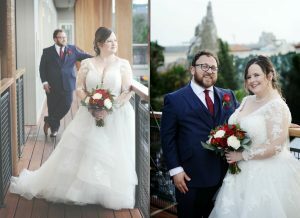 The couple wanted Christmas red and white for their colors and it turned out beautifully. Susan even had the surprise of a “hidden Mickey” tucked away in one of the blooms. Christopher Smith with Snap Photography did an amazing job with the wedding pictures. From the moment they stepped on board Paddlefish, Chris was busy capturing every moment. From getting ready to the ceremony and afterward for family pictures the photos were creative and beautiful. We wish Susan and Chris a lifetime of happiness.